I love green beans. They are one of the central foods of my heritage. My mother talks a lot about the bags of Kentucky Wonders she used to pick through and snap with her mom and sisters in Cincinnati. Every other year I put a bunch in the ground just so I can bring her a good bowl full for a Sunday meal. Fresh beans were grown in all of the places where my family is from, no garden was complete without them. I have only eaten canned green beans once and that was enough, so there’s no way I’ll eat them ever again. The only thing that should be olive colored in my opinion, is an olive. Green beans aren’t in season right now, but eating green vegetables is far more important to me and my health than eating the usual winter fare of pickled, salted vegetables and roots and tubers. I don’t go out of my way to break too many of the rules of local eating, but green beans are a definite weakness, alongside broccoli and other medium and dark green foods. The following salad is just something that I must have when all else fails. Food and Economics point: let’s say for example that you DID buy green beans when they were really cheap, good looking, and readily available. The simple blanching technique used in this recipe is a good way to make your OWN frozen green beans or just having green beans around for a few days to make various recipes. When blanched, you can easily sauce them, spice them, heat them up, and use them in other recipes with most of the work and fuss already done. Special Ingredients: I used The Ancient Olive’s Persian Lime infused olive oil. I visited their store in St. Augustine while visiting and working at Kingsley Plantation. Their oils and vinegars are not cheap but they are extremely good. Much of what they have to offer can easily be paired with this recipe. Citrus flavors, herb flavors, onion and garlic flavors, would all work with this recipe. If you like balsamic vinegar they have excellent pairing guides to use their flavored vinegars in conjunction with specific flavor-infused oils. 4 tablespoons of red, yellow and orange bell peppers, cut into small cubes…use a bag of baby bells if possible. 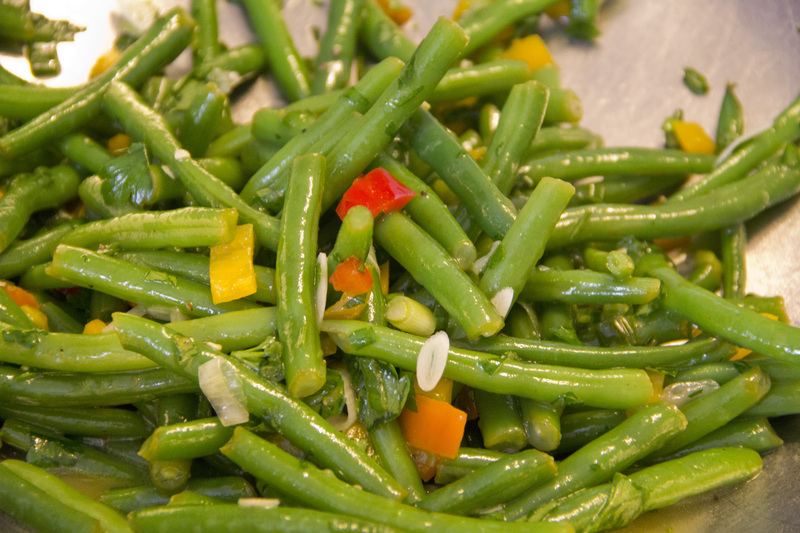 Place green beans in a large pot of boiling water seasoned with sea salt. Have at the ready a colander and a large bowl full of ice and water. Cook for 5 minutes then immediately drain and plunge into the ice bath until the beans are barely warm. Have prepared, or prepare the vinaigrette while the green beans are in the ice bath. In a small bowl, whisk together the olive oil, lemon juice, oregano, garlic, herbs and salt and optional sugar. Place the green beans in a non-reactive mixing bowl, add the chopped peppers, splash on the vinaigrette, mix well for a minute or two, and then allow the green beans to marinate in the dressing for about and hour or so. Toss well before serving. Variation: Instead of lemon juice–use balsamic vinegar. Measurement adjustment: 1/4 cup of balsamic vinegar to 1/2 cup of olive oil. Thank you for this recipe! I know I should be grateful for the abundance, but we got so darn blessed with green beans this year that even my freezer is bored of them. The flavors and colors here are a celebration! I grow KW 🙂 but at the time I had to buy bush beans from the store. You are right.. more and more we have to grow the varieties we cherish.